Are you embarrassed by your yellow or stained teeth? Although it probably took years for your smile to become dull, it only takes one professional teeth whitening session to improve the appearance of your teeth. Dr. Robert Sanford, your Allentown, PA dentist at Stanford Center for Total Health Dentistry, shares the advantages of professional teeth whitening. Reduced Sensitivity: Teeth whitening agents can irritate your sensitive gums and roots and cause pain for several days after you use a whitening product. Before the whitening process begins, your Allentown dentist applies a protective gel to your gums and roots. He also uses retractors to pull your cheeks and lips away from your teeth, protecting these sensitive tissues from irritation. There are a number of possible options for patients to explore when they want whiter teeth. Some people choose to go for over the counter products which include whitening strips, trays, and mouthwashes. The problem with these solutions is that they’re often difficult to use and usually take a long time to produce results. For instance, OTC whitening trays take weeks to work and are messy to deal with on a daily basis. 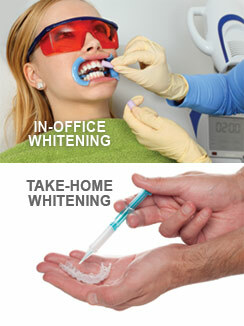 Patients who want reliable and immediate whitening results opt for treatment at a dentist’s office. When patients want a reliable and fast solution for discolored teeth, they can get results in just 60-90 minutes at Dr. Robert Sanford’s dental practice in Allentown. Using a high-powered whitening solution (commonly made of hydrogen peroxide or carbamide peroxide), Dr. Sanford can improve the color of a patient’s teeth by up to eight shades. Once the whitening session is complete, the results will last for six months to as long as two years. 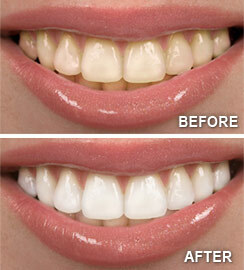 Do you want brighter & whiter teeth? at (610) 820-6000 to learn more about professional teeth whitening!